THIS POST ORIGINALLY APPEARED ON THE NATIONAL INVESTMENT COMPANY SERVICES ASSOCIATION (NICSA) BLOG HERE. Some numbers get your attention. When shares of the IT and Business Process Outsourcing (BPO) giant, Infosys fell by 21% on a single day in April, it could have seemed an ominous sign for the firm and the outsourcing industry generally. Not so, says Infosys. In fact in response to a question about the state of the IT and BPO business proposition for NICSA member firms, Infosys contended that these companies can still see a “40-60% cost savings through a combination of standardization, consolidation, cost arbitrage and efficiency” by using an offshore outsourcing model. Scale seems to help these providers. The top five IT and BPO service providers in India grew by 13.3% in the recently ended fiscal year according to The Economic Times of India. This compares to a growth rate of 2% for the industry as a whole. 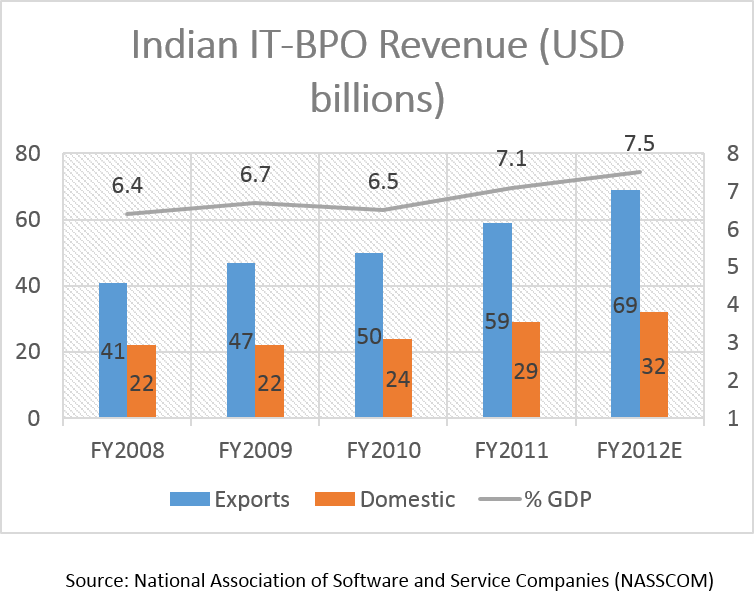 Fiscal year 2012 was the third year-on-year increase for the industry in the last four years according to the National Association for Software and Services Companies (NASSCOM) which tracks both hardware and software revenues (see chart). However, the fact is the top five outsourcers and the industry as a whole saw the rate of growth diminish compared to the previous year. It is notable that for some firms such as Tata Consulting Services (TCS), a strong quarterly result was part of a positive outlook extending into 2013. According to a recent Wall Street Journal article, TCS posted an increase of 22% in quarterly net profit and plans to hire 45,000 employees in the fiscal year that began April 1, 2013. For its part, Infosys remains optimistic that it can deliver the intended results for its clients. The optimism came through in responses to a number of questions I posed recently. I asked what they thought the overall outlook was for outsourcing in 2013: “While the US economy is on the path to recovery there will be increased outsourcing towards the later half of 2013 as companies look to cut costs and become more competitive in the [newly] changed global economy.” They think this is true of Europe, despite (or in some cases because of) its economic woes and of Asia Pacific firms as well. Infosys sees the growth rate in IT outsourcing at 6-10% and thinks the rate of growth for Business Process Outsourcing will exceed that number. 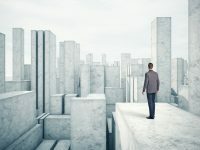 To sustain this growth offshore firms are having to adopt new operating models, new commercial structures, and to undertake internal reorganizations that allow them to perform more end-to-end services. One example Infosys gave of how they are using these innovations to attract business was of a European client for whom they are going to provide BPO services across their entire back office. This ranges from providing fairly low complexity services around account openings and reconciliations to more complex ones around corporate actions and Know-Your-Customer compliance. Another aspect of these changes is what it means for growth of the US-based operations of Indian firms. In Infosys’ case they are increasing their US presence and have opened new delivery centers to facilitate their ability to provide end-to-end services and leverage alternative talent pools. This was echoed by an executive of another Indian firm who told me his company was expanding in the US to build a base of subject matter expertise in various financial services domains. 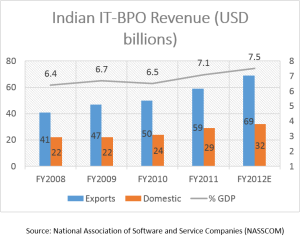 Judging by what they are saying and, more importantly perhaps, by what they are doing, the perspective from India on the subject of IT and BPO outsourcing is clearly focused on the promise of future growth.